Derby scored three times in the second half against 10-man Watford to secure a fifth straight win and equal a club record points tally. Watford led early on through Troy Deeney's cool finish as they chased the remote possibility of a play-off place. But the first of two Jeff Hendrick goals levelled it before Craig Forsyth's drive put the Rams in front. Marco Cassetti was sent off and after Mathias Ranegie had equalised, Hendrick and Chris Martin, late on, won it. Deeney had given Watford the perfect start as he ran onto a pass from Cristian Battocchio to lift the ball over Lee Grant and claim his 23rd goal of the season. But Derby replied with a clutch of chances and it was no surprise when Hendrick latched onto an attempted clearance from Daniel Pudil to slot the ball past Jonathan Bond from 12 yards. Jamie Ward was then denied by Bond as the home side continued to dominate and with an hour gone they went ahead when Craig Bryson set up Forsyth to fire home. Watford were then reduced to 10 men when Cassetti received a second yellow card, while results elsewhere also conspired to end their hopes of a top-six finish. But the Hornets did equalise two minutes later when substitute Ikechi Anya crossed for Ranegie to head past Grant at the far post. Both sides then had chances to go in front but it was Derby who grabbed the initiative again thanks to a stunning goal from Hendrick, who crashed a 25-yard shot past Bond. 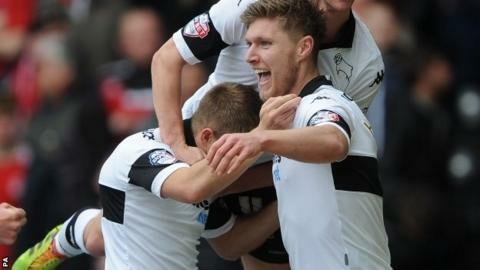 Top scorer Martin then got in on the act as he slid the ball home from a tight angle for his 23rd goal of the season as Derby equalled the 84 points achieved by Billy Davies' promotion-winning side eight years ago. "What we have tried to do is provide consistency, not just in results but in performance. That's what we need to get back to, making it difficult for opponents and not thinking we can just go out and outscore them." "I have to say sorry to everyone, all the supporters that came here today. But sometimes football is like that, you have a good performance and then straight after you have this kind of performance. "What is very disappointing for me is that we didn't show the right anger today to win this game. "I am looking for a strong finish to have an assessment of which players can help us next season and to show a good commitment to the club and the supporters." Match ends, Derby County 4, Watford 2. Second Half ends, Derby County 4, Watford 2. Attempt missed. Daniel Pudil (Watford) left footed shot from outside the box is high and wide to the right. Assisted by Daniel Tözsér. Attempt blocked. Patrick Bamford (Derby County) left footed shot from the centre of the box is blocked. Assisted by Andre Wisdom. Attempt saved. Craig Bryson (Derby County) right footed shot from outside the box is saved in the bottom right corner. Assisted by Craig Forsyth. Offside, Watford. Troy Deeney tries a through ball, but Cristian Battocchio is caught offside. Corner, Watford. Conceded by Simon Dawkins. Attempt saved. Marco Davide Faraoni (Watford) header from the left side of the six yard box is saved in the top left corner. Assisted by Daniel Tözsér with a cross. Corner, Watford. Conceded by Craig Forsyth. Substitution, Derby County. Will Hughes replaces Chris Martin. Goal! Derby County 4, Watford 2. Chris Martin (Derby County) left footed shot from the left side of the box to the bottom right corner. Assisted by Craig Bryson with a through ball. Attempt missed. Troy Deeney (Watford) right footed shot from a difficult angle and long range on the right is too high. Assisted by Marco Davide Faraoni. Goal! Derby County 3, Watford 2. Jeff Hendrick (Derby County) right footed shot from outside the box to the bottom left corner. Assisted by Simon Dawkins. Attempt missed. Simon Dawkins (Derby County) right footed shot from outside the box is close, but misses to the left. Assisted by Chris Martin. Attempt blocked. Andre Wisdom (Derby County) left footed shot from the right side of the box is blocked. Assisted by George Thorne. Offside, Derby County. Andre Wisdom tries a through ball, but Jeff Hendrick is caught offside. Attempt blocked. Johnny Russell (Derby County) right footed shot from the right side of the box is blocked. Assisted by Craig Bryson. Attempt saved. Jamie Ward (Derby County) right footed shot from outside the box is saved in the top centre of the goal. Goal! Derby County 2, Watford 2. Mathias Ranégie (Watford) header from the centre of the box to the bottom left corner. Assisted by Ikechi Anya with a cross. Second yellow card to Marco Cassetti (Watford). Attempt missed. Chris Martin (Derby County) right footed shot from outside the box is close, but misses to the left. Assisted by Craig Bryson. Attempt missed. Craig Bryson (Derby County) header from the left side of the box misses to the left. Assisted by Jeff Hendrick with a cross. Corner, Derby County. Conceded by Daniel Pudil. Attempt missed. Chris Martin (Derby County) header from very close range misses to the left. Assisted by Craig Bryson with a cross following a corner. Corner, Derby County. Conceded by Cristian Battocchio. Corner, Derby County. Conceded by Lloyd Doyley. Attempt missed. Johnny Russell (Derby County) left footed shot from the left side of the six yard box misses to the right.